13 November 2014, at 12:57p.m. US - Two South Dakota State University researchers will examine a new influenza virus that affects cattle and pigs through a two-year, $393,530 National Institutes of Health grant. Virologist Feng Li and immunologist Radhey Kaushik will study the biology, genetics and evolution of the virus that has 50 per cent similarity to human influenza C.
Professor Feng Li transfers the cell culture into individual wells of a 96-well plate before infecting them with a new influenza virus, which he has proposed calling Type D Influenza. Both faculty members have joint appointments in the biology and microbiology and veterinary and biomedical sciences departments. "The virus has not been shown to be pathogenic in humans. No one should be afraid of this," Kaushik cautioned. "This is important work because so many questions remain to be answered about the virus," said Ben Hause, now a research assistant professor at Kansas State University, who uncovered the virus three years ago while working at Newport Laboratories in Worthington, Minnesota. He identified and characterised it as part of his doctoral work at SDSU under Li's tutelage. Although it was first discovered in pigs, Hause found the virus was far more common in cows. "A high percentage of cattle with respiratory disease tested positive," he said, pointing out that "it's common for cattle to be infected with this influenza virus." Because it occurs in association with pneumonia, this virus may be part of a disease complex, Li explained. Doctoral student Runxia Liu uses a solid phase assay to evaluate the receptor binding properties of a new influenza virus. 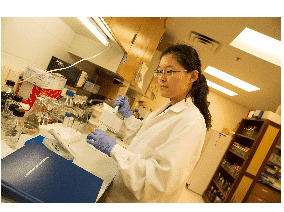 Doctoral student Runxia Liu did further research on the virus, generating data to support the NIH application. From an evolutionary standpoint, this virus shares common ancestry with known influenza viruses including those that have caused seasonal influenza epidemics, Li added, noting that the virus has also been found in China. He has proposed calling it Type D Influenza because of its distinctness from other influenza types—A, B and C—to the International Committee of Taxonomy of Viruses. The researchers will develop genetic and biochemical tools to study the virus and then determine how the virus is transmitted and how it replicates at the molecular level. Ultimately, the goal will be to determine whether the virus can cause problems in humans, Kaushik explained. "If the virus can undergo reassortment in combination with a closely related human influenza virus, it may be able to form a new strain that could pose more of a threat to humans." 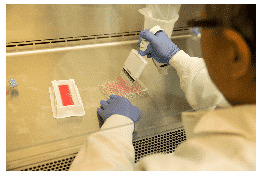 Li said, "From a science viewpoint, it's very exciting to work with a brand new virus. There are so many mysteries to solve—where and when this virus emerged and what its animal reservoir is in nature."